A mooch, a pootle, a derelict, two horses and a shudder. The formula for moving. – The Diesel-Electric Elephant Company. A mooch, a pootle, a derelict, two horses and a shudder. The formula for moving. I have had to learn many things in order to live on the canals. The Mongolian all-weathers “Shrinking-Throat Death Knot”. How to light a fire using only two spoons and a fresh weasel. That some people are just plain miserable and always will be no matter how many times you hit them with a shovel. …to name but three examples. Ranking highly among the many items of my education has been the ancient Mayan “Formula for Moving” required of we gypsies, tramps and thieves*. The Mayan Formula For Moving. Item 1. Some moorings are, quite rightly, 48-hours and not a nano-second more may you moor. The general towpath – where not causing an obstruction, inconvenience or fold in space, time and ducks – is more of a moor here for up to fourteen days jobby. Simples, I hear you say in that raffish, affected, meerkat way of yours. Well, yes and no. A chap has needs in life: a string of race-horses; a little country pad (mayhap Chatsworth); a stable block full of Astons, Jaguars, Morgans and the odd classic Jensen – oh yes, and water (potable and domestic); rubbish disposal and, um – Thunderbird facilities. Such complications tend to confound the workings of the “just move on” formula, so that it is not just a linear scribble on a map. Item 2. 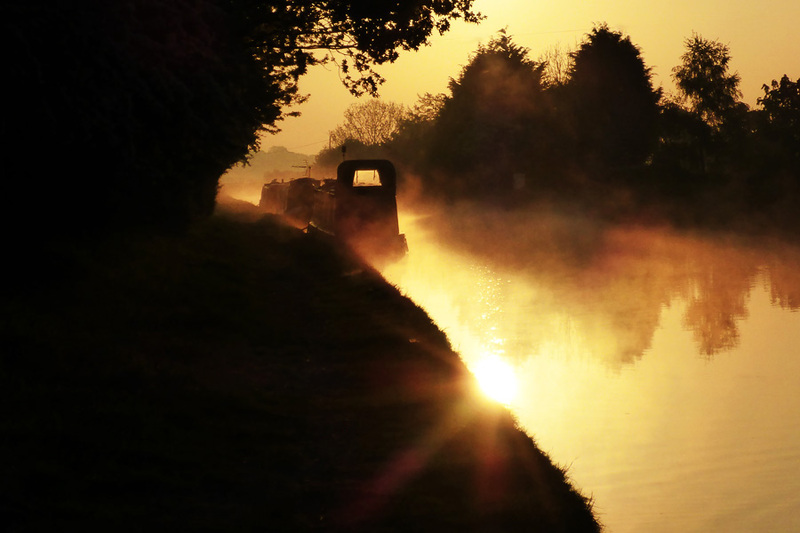 Narrowboats, while narrow, are a tad lengthy – much longer than the average canal is wide. They can therefore only be volte-faced, about-faced or, if you are civilian, turned in winding holes (“winding” pronounced as in “they call the wind Maria”). Consider in close calculation to Item 1. Item 3. Yonder canals of England are quite old. Older even than I. Aye, older even than a very old aye-aye. At least one is Roman, most of the rest have been hanging about since England decided that steam and mills and factories were a “good idea”. Yonder canals of England oft break, and find themselves in need of some repair (as do we all). Consider in close calculations to Items 1 & 2. My trusty “Secret Key” from Messrs Yale & Co unlocks all manner of good things. Item 1+2+3. Service points and winding holes are relatively far and few between, and are dotted around the system in a most random fashion. Some of the CaRT service points don’t exist anymore in the real world, Barbridge being one case in point. Repairs and wotnots mean closures, and a closure on a canal isn’t like a closure on a road, you can’t just duck through another neighbourhood to avoid the chaps with the “Stop-Go” signs. Item 4 of the calculation is so ill-defined (and should remain so, I believe) that it is not possible to include it in the calculations, but merely in the considerations. Item 4 states that one must not move from “place” A to B and then back to A, or even A to B to C and repeat and rinse (a sensible enough requirement and pefectly reasonable, ish). It also requires that one must be undertaking “bona fide navigation”. This is somewhat difficult to include in the moochings and boaterings arithmetic – because “place” is not and will not and (currently) cannot legally be defined, and my bona fide navigation is always going to be someone else’s subjective wingnut. Item 4 is thus an ill-defined (undefined) sledgehammer to crack a very well-defined inner-city nut (for that is where 90% of the problem that officialdom is “attempting” to address lies). With respect, I say to those brandishing such nebulous nonsenses, grow a hairy set and kindly fix the actual inner-city and tourist hotspot problem, instead of disconveniencing everyone with the same brush, if you’ll pardon my mixed metawotsits. Even if you won’t pardon my mixed metawotsits. Since it is impossible to quantify (and ought to remain so), I dismiss Item 4 from my sailing plans and actualities, substituting instead that rare mineral, COMMON SENSE. I follow the restrictions, I move and I rove about, and therefore I am. See Cardinal’s log for details. The Cardinal, back at Calveley Services, but this time moving back the way we came. Five-hundred litres of your finest H2O please, landlord, no ice, no slice. The formula for moving a la gypsies, tramps and thieves is thus not, as one might have thought, a simple move-stop-move-stop in progression. It’s more of a move-stop-plan-for-next-services-move-stop-move. Thus, while in recent (uber-slow, canal-time) times I have been mooching towards Chester and Ellesmere Port, Chester is closed and will be for some days. Apparently a cast-iron thrug-trundle snimbled on a stone sog-futtock, or something, and needs rebuilding. To obtain water, empty Thunderbirds 1, 2, 3 & 4 and recycle my recyclable detritus the Cardinal and I have had to turn back the way we came. Since we’ve had to do that we may as well make it a liesurely turn, and we’ll try “Plan A” again in a week or two, probably, if we feel like it and if the repairs are complete. The trip from there to here was, as Mr Stanley Unwin once said, splendifibode maximal sun-shiny with waterylike bittings and peaceful posies. A very gentle pootle, I claimed my place at the Calveley taps a bare, a scant minute or two ahead of two other (unfortunate, tee-hee) boats and such weed as found our propeller took itself off after merely saying hello. Long may it continue to do so. We met no-one at points of inconvenience, such as the bridges and the ninety-degree blind turn onto the Middlewich Branch from the main canal and, my performance-art in the winding hole aside to be discussed later, my manoeuvring was respectable. I even remembered to give the stern-gland greaser a twist once the dust had settled. So, where does this leave us? Well, sort of here, really, on this odd little stretch of canal with its strange currents that jiggle the Cardinal around even when there’s no boats approaching, no lock activity and no breeze. Well, not here as such, this is someone else’s boat a fetlock and half a boot-slog up the canal (or down, I have no idea which). Someone else’s boat in the morning smoke. As is customary on the days when I feel that it ought to be customary (and not when I don’t) I went for a stroll at Sparrow-Fart O’Clock this morning, and very picture-skew it all was too. It may be mid-May in England, but there were still patches of a very decent frost around and about while the early sun boiled smoke off the water. It was someone’s pride and joy too, once. Now it flutters with notices and warnings from CaRT, and I think someone’s dumped a bag of rubbish on it, human creatures being what they are. Has someone forgotten that they own it? Did someone shuffle off this mortal coil and not take it with them? Has someone just decided to leave it to other folk to clear away? Who knows? Whatever the reason, it’s not a good thing to do. Such sport as may be had in this mooring will be had, like as not, in watching the winding hole. I performed a very neat thirteen-and-a-half point turn with the Cardinal yesterday (as in “looked like a right Dilbert, in front of a very dour fisherman who had settled the area with rods and nets and tents and seats and boxes”). Let’s see how everyone else does it, eh? The “shudder” of the title? Well, in one direction my early-morning stroll took me past the marina that the Cardinal, the Bro and I spent so much time in with the woodworking and the wiring and the plumbing of last year. Now that we’ve had a taste of freedom such places are really not for me. Can’t stand most people, for one thing. Doubtless the sentiment is reciprocated. Packed in like a dry sardine and paying a fortune to yet another third-party for the privilege is not my idea of a good time. I have put much time and effort into wresting myself free from government and from such commercial concerns, and I do not wish to be thrown back to them like some tasty morsel for the dogs. I have my doubts, I have a bucketful of doubts, but I do hope that this mooching and pootling way of life is left undisturbed by the Trust for many years to come. Its cessation at the systemically metropolitan hands of any organisation* with a mismatch of modus, motives, mind-set and methods would require me to be dragged kicking, screaming and biting, anyway, and that’s never pretty or dignified. *NB, referring exclusively to the organisation, not to the lower ranks, the people, the workers. It is perfectly possible to staff a wholly mis-directed organisation with thoroughly nice and hard-working people. An organisation is never, whatever they may tell you, its people. An organisation is, among other similar considerations, whatever its sources of funding require it to be… and that is where the systemic mis-match comes into play in this case. What a lot of boaters think that the Trust is set up to do is not what its funding sources are telling it to do. We’re here now for a week, maybe two, and when you think about it, now is all that we really have, isn’t it? If you think that time is lumpy and subjective when in bricks and mortar on land, try time on the canals! Time, like the Mysterious Mayan Formula for Moving, is most definitely not linear. Wherever I was, I’m not there anymore. Just what I needed to ease the stresses of……nothing like it must be to find your life line out of order. What an amazing picture and a story from the pen of Cardinal Wolsey nice one Sir!